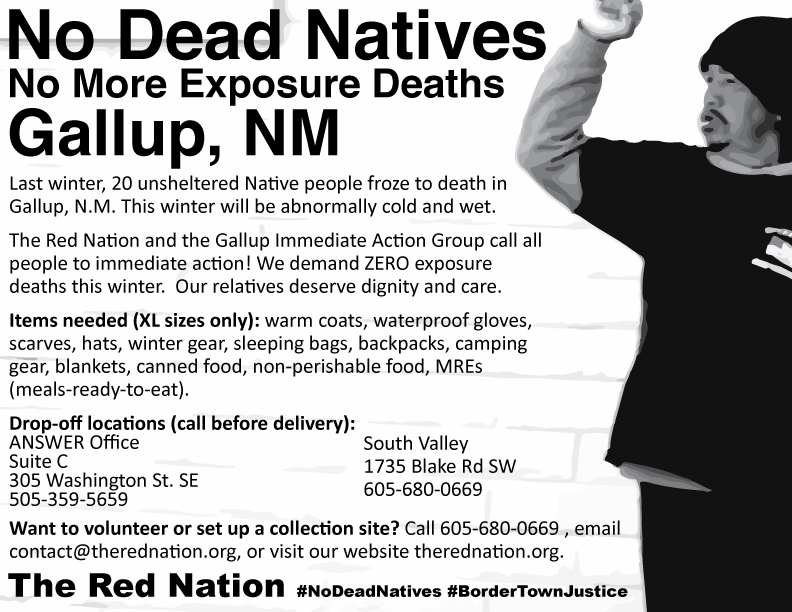 Call to Action: #NoDeadNatives in Gallup, N.M.
Last winter, 20 unsheltered Native people froze to death in Gallup, N.M. Many were Diné (Navajo). The National Weather Service predicts, because of climate change and El Niño, this winter will be abnormally cold and wet. This harsh, unusual weather makes our relatives living outside especially vulnerable. Many in Gallup are still denied access to shelter, services, and dignity. They are in dire need. The Red Nation, the Gallup Immediate Action Group, and Radmilla Cody’s For the People call on all people to remember our relatives forced to live on the streets. Their lives matter because they are our relations. We demand zero exposure deaths this winter. Immediate action is needed! Our relatives need your help! No one should be neglected or denied care! We are setting up collection centers for warm coats, water-proof gloves, scarves, hats, winter gear, sleeping bags, backpacks, camping gear, blankets, canned food, non-perishable food, MREs (meals-ready-to-eat). Please bring XL sizes for all clothing. We are also accepting monetary donations that will go directly the Gallup Immediate Action Group (website coming soon). This holiday season, please remember those most in need. Any contribution helps. All help is welcome. This is for the people. Enter your email address to follow The Red Nation.